This pendant is a holloware piece, meaning that it is made from two separate pieces of hammered ingot sheet silver (a flat sheet which serves as the backing and a convex portion which rises above the plane of the flat back) which form a hollow body within the piece. 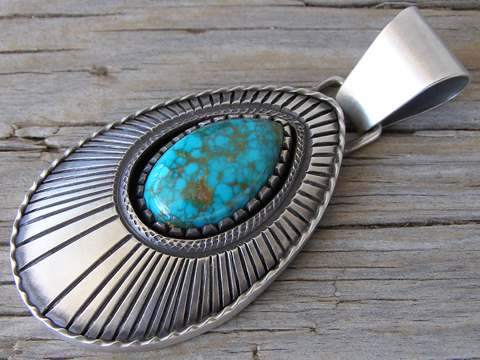 This stone of natural, untreated Royston turquoise from Nevada is set in a shadowbox cut-out and secured in a handmade notched bezel. It's a beautifully executed piece with perfect stampwork. The bale on this will accommodate Erma Arviso's antiqued Sterling beads up to 7 mm. diameter. Dimensions of pendant (excluding bale): 1 7/8" x 1 1/8"